Nicola Dutto is a professional motorbike rider. 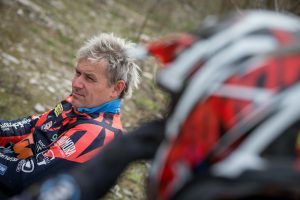 He suffered a spinal cord injury during the Italian Baja in 2010 when he hit a big rock. As a result Nicola became dependent on a wheelchair in his everyday life. After a long rehabilitation period the former European Champion was able to do something that was thought to be impossible and got back on his motorbike. 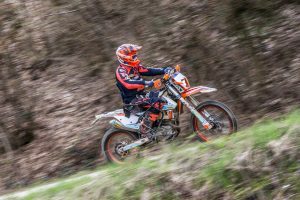 His latest goal: participating in the Dakar Rally 2019! Finding the right cushion has been has been a real challenge for Nicola. Before knowing Vicair the main problem he was facing were skin issues on his buttocks when racing. In 2013 Nicola met the owner of Vicair, Max Rogmans. Max offered to develop a special cushion using the Vicair technology. In 2014 Nicola started racing on the new motor saddle cushion and finished races like the Baja 500 in Mexico (440 miles) and the Vegas to Reno (530 miles). 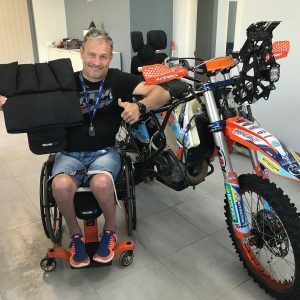 The cushion provided Nicola with the necessary protection and support during the 14 to 18 hour non-stop races through dust, mud and stones and with temperatures around 44 ° C.
Nicola uses the Vicair Active O2 in his wheelchair. 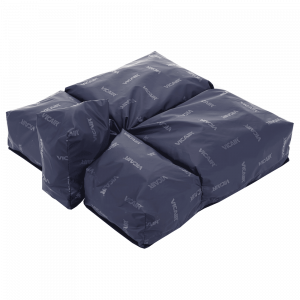 The high level of skin protection in combination with the fantastic positioning possibilities make this cushion the best available for his active lifestyle. Before the Vicair Active O2, Nicola had been contently using the Vicair Active for 4 years. In 2017 the Vicair O2 version of this cushion was launched, which is when he changed cushions. Pictures are provided by Nicola Dutto. Rights reserved. Medical practitioners often work with complex cases in the field of seating and positioning. Generally our Vicair Adjuster O2 and Vector O2 are able to offer a solution, but sometimes it is necessary to provide a solution that is custom made for the client. 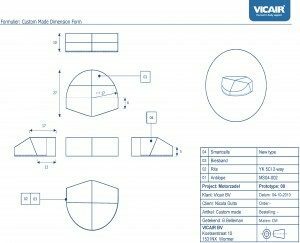 For those situations it is possible to create a Vicair Custom Made seat- or back cushion.